Following the Gold Rush and statehood in 1850, California became known globally as a land of growth and promise with cosmopolitan cities and many thirsty men. 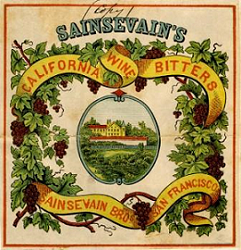 Prominent beverage companies from Europe and other states that wanted to be part of this prosperity filed trademarks in California. At the same time, immigrants to California saw the agricultural opportunities in their new state and began producing, among other things, apple cider and wines that would eventually become world-famous. The term “bitters” refers to a bitter, usually alcoholic, liquid made from various roots, herbs, bark, seeds, or fruit peels. Today, bitters add a fragrant and flavorful element to cocktails. 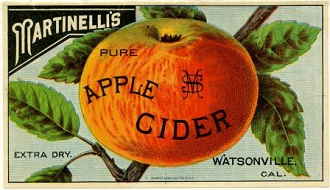 Historically, though, bitters were often used for medicinal purposes and advertised as having curative powers. 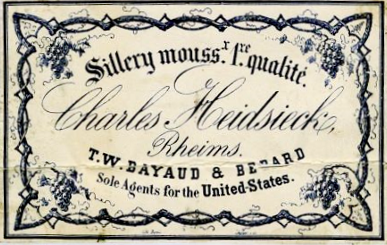 Charles Heidsieck (1820-1871), a French wine merchant, was known as, “Champagne Charlie,” because he popularized the festive beverage during visits to the United States. Counterfeit marks and fraudulent imitations threatened Heidsieck's business, so in 1864 Heidsieck's American distributor, Theodore Bayaud, registered Heidsieck's trademark with California's Secretary of State. Three years later, two French merchants named Souris and Dresel were ordered to pay Heidsieck 10,000 francs by a Paris court. The two men had conspired with Bayaud to manufacture fraudulent champagne bottle labels and corks meant to imitate those used by Charles Heidsieck. The main difference was that the false labels (not registered in California) bore the name of Herman Heidsieck, a Missouri resident, who had loaned the use of his name to complete the subterfuge. Even with the temperance movement on the rise, many households kept alcohol on hand for its "health and medicinal" properties. 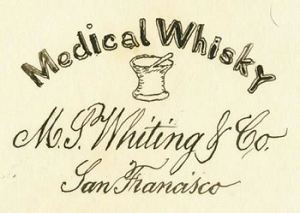 Manasseh S. Whiting, author of California Senate Bill 31 (1863), "An Act Concerning Trade Marks and Names," registered a trademark for his firm's "medical whisky."